Cow admits to be rather underwhelmed by Bond's clothes. Especially the button sweater worn over a white dress shirt. Imagine her dismay when she found that Ford. 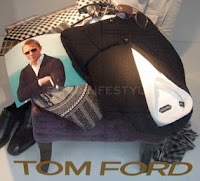 Tom Ford has seized the moment to offer up the cardigan for sale in exlusive European shops. Ugh. Why the understated Brioni has been replaced with the sweater-for-sale Ford is beyond her, and wonders whether Ford is also responsible for the white jeans travesty seen in the Haiti part of the moovie. Despite the dorky clothes, Quantum is still a good moovie, and highly recommended. Did you like the bare chest in Casino Royale? Cardigans on men are kind of twee. Still, they do look more stylish than a hoodie teamed with a pair of jeans that hang low down. I mean, what exactly is James Bond meant to wear in 2008? He has to wear clothes that say "I can wear whatever I like 'cos I am a real MAN". It's better than a mall-walking warmup suit. Gorilla: Why yes. Cow liked the bare chest, or any other parts Mr. Craig would like to bare. And wished for more in Quantum. Sigh. Linda: Ha! You're right on the hoodie. Cow thinks Bond could have been stylish in a number of things, but NOT buttony cardigans. Dog: Dogs, of course, have inherent style, whether walking in a mall or, perhaps, around a hydrant. Or two. He should have worn a proper cardigan. Beige, wool, chunky 'football' buttons and pockets big enough to hold a kitten in one and a bag of jelly babies and a pipe in the other.